IBPS,Postal,Insurance and other state level recruitment examinations. 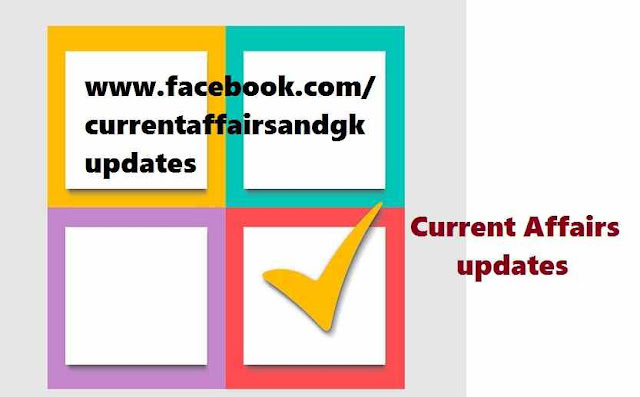 Current affairs updates till October 8th are covered.Updates on 7th October and 8th October are provided. 1.Jack Dorsey is the new CEO of Twitter.Twitter gave it's co-founder a 2nd Chance as CEO. 3.Rajveer Meena,a 21 year old Indian Student has set a Guiness World Record by memorizing 70,000 post-decimal digits of Pi beating a Chinese who had held this record for 10 years. 4.Rajveer Meena is a resident of Mohocha village in Swaimodhapur district of Rajasthan.Rajveer set this record by reciting post decimal pi values in 9 hours and 27 minutes. 5.Indian Origin hedge fund manager Ranjan Tandon and his wife Chandrika have donated $100 million (Rs.652 crores) to New York University's School of Engineering. 6.The Indian Navy commissioned Indian Naval Ship (INS) Astradharini. The vessel will be used to carry out technical trials of underground weapons and systems developed by Naval Science and Technological Laboratory (NSTL) which is a Naval Systems Laboratory of DRDO. 7.Bollywood superstar Hrithik Roshan has been announced as India's ambassador for "The World's Largest Lesson",an initiative launched by the Global Goals Campaign and UNICEF. 8.The World's Largest Lesson aims to teach children in over 100 countries about the new Sustainable Goals. 9.Sharukh Khan,the badshah of Bollywood to receive honorary doctorate from the University of Edinburgh,one of Britain's most hallowed schools of learning. 10.Telenor,a telco in India (previously Uninor) begin offering life insurance to it's existing customers and new customers which covers staring from Rs.5,000 going up to Rs.50,000 while the customers need not pay any premium.